Sitting down to any holiday meal (much less an average dinner) can be a quintessential lesson in the power of culture and its influence on the food and beverage market. Who hasn't had the experience of dining with vegetarians, gung-ho meat eaters, self-diagnosed gluten avoiders or kids who eat nothing but mashed potatoes and gravy? 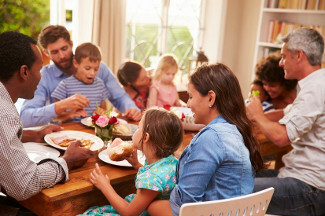 We can find culture around a dinner table both in customary practices (where we sit, our choice of foods and beverages, how we serve and present foods and beverages) and also symbolically in our values and beliefs about food prohibitions, the perceived effects of food on the body and even family hierarchies. 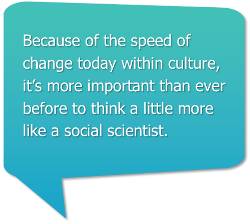 Hartman Group social scientists and analysts have been studying culture for over twenty years. We find that culture is embodied in the mundane and the extraordinary; it is evident in many places, and yet it can be hard to pinpoint. At its roots, culture is not simply a collection of artifacts and rituals: culture encompasses the assumptions, meanings, ideals, goals, habits and ways of interpreting the world that a particular community shares. At its essence, culture is the context in which we live our lives; it is a force that determines behavior, constrains choice, shapes desire and defines need. 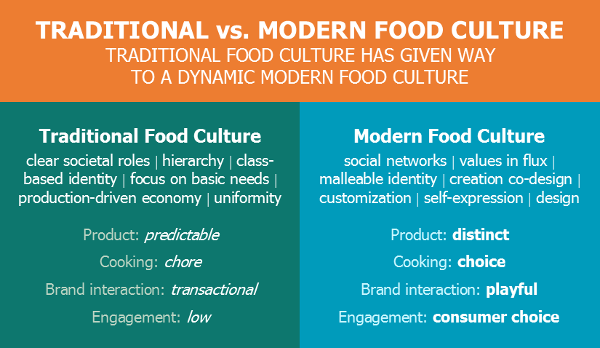 We often talk about "food culture" at The Hartman Group. Food culture can be defined as everything about foods and beverages beyond personal preferences. Food culture is driven by a significant cultural apparatus that includes everyone in the business of food including, but not limited to, chefs, media, manufacturers, producers, retailers, food service, institutions, healthcare, government and, most importantly, the consumer. Why does cultural analysis matter? Changing societal roles: Two generations ago, it was typically the female head of household who was responsible for cooking and shopping. Today, domestic roles and responsibilities have changed, and we are actually doing less cooking inside the home. Traditional food culture vs. modern food culture: Traditional food culture was generally about serving basic needs and providing safe and consistent food. Today, consumers are delinking from tradition, and the focus is on fresh with a general movement away from products they believe are manipulated. Food culture is shifting our collective tastes from bland, iconic and familiar to fresh, bold and global. Similarly, cooking used to be a chore, but today it’s a choice. Consumers are fully engaged with food: In the past, it used to be only cooks who were engaged. Today, consumers want to be involved in the design process, and they can decide how involved and engaged they want to be with their food. Cultural literacy is more important today than ever before, since consumers are highly food literate themselves and therefore have higher expectations of food companies. Increasingly, they want information available, accessible, transparent and customized – the trick lies in how to determine what that means and deliver it on culturally relevant terms.